According to the Yee's genealogy records, our 17th generation forefather, Yee Yìng Sīng, was unable to bequeath his estate and fortune to his son, Fú Yuán. The Chinese custom of that era dictated that Fú Yuán must have a son of his own in order to inherit his father's estate. Since Fú Yuán had no heir, Yìng Sīng's estate and fortune went to his grand nephew Baishòu instead, Baishòu is the eldest son of Xí Gōng and a grandson of Yìng Àng (Ying Sīng's brother). Baishòu had a son named Fèng Tái who had three sons of his own; Kwong Míng (Dūn Mù Tong), Kwong Dá, and Kwong Dào - introducing the 22nd generation Yees! Kwong Míng married the daughter of Supernumerary Official Mah Yún Jiān. Mrs. Kwong Míng is known to us as great grandmother Mah. She was special in many ways, including the unusual feature of being singled breasted. Great grandmother Mah was always known as a virtuous and a filial woman. Unfortunately, great grandmother Mah was widowed early. Her kind father donated a piece of land with good Fēngshui for her to bury her beloved husband. This burial ground is located on Táishān's Cháo Jìng area, approaching Mt. Lóngshān. Great grandmother Mah raised her only son through many hardships and she taught him well. Great grandmother Mah also had many grand children. Before she died, she requested that her descendants to keep an affinity of the Yee-Mah relationship. She suggested that every ten years they gather together and hold province-wide graveside ceremonies to pay their respects to the Yee and Mah ancestors. It was great grandmother Mah's wish that we celebrate the great virtues of our ancestors and uphold the close relationship between the Yees and Mahs. The Mt. Lóngshān ancestor burial ground was invaded by another clan during the Ming Dynasty. Yee Fu Yàn, one of Yee Yìng Sīng's great grand children, went over there immediately with his clansmen, dug up the graves and moved the bones to the bottom of a nearby pit after he learned that the Mt. Lóngshān ancestor burial ground was going to be invaded. Negligently, he also dug up ancestor Yee's grave and threw his remains to the pit bottom. Once he realized this terrible mistake, it was too late for him to correctly identify all the bones. The only thing he could do was make a commemorative silver tablet to bury alongside the remains. In the meantime, Yee Fu Yàn fought alongside the Ming Dynasty's brave and courageous General Wong Hing against the Ching Dynasty's army. Fu Yàn was stationed at, and guarded, the Díhai Wan Yu Ào village. There he fortified the entire barrack area and made an underground cellar by tunneling. This extra fortification was necessary in order to defend against their enemy. The villagers erected a stone monument to commemorate this historical incident. It's a joy after your nation's righteousness was restored. When comparing to the Spring and Autumn Periods past. Upholding loyalty and righteousness records. Your name and honor shall always be respected." Great grandmother Mah was buried in Mt. Hú Lú; about two kilometers from Díhai. This burial place was called Wai Dì Hú Lú. 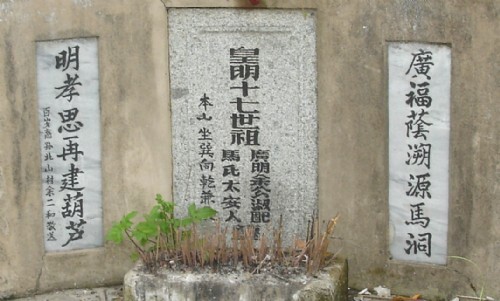 This land was once owned by her son's adopted father, Lee Zhàng. From her Wan Yu Ào village home, great grandmother Mah once saw a dragon spirit soar into the sky. She knew that this was a very good sign for this piece of land. Later, when Lee Zhàng was gravely ill and dying, he summoned all his children and grandchildren together to discuss how to divide his estate. Great grandmother Mah made a special request of Lee to give this farmland to his adopted son. The Lee family realized that this farm land was infertile, it held no value to them at all, so they all agreed to give this land to his adopted son. That's how this wonderful burial place came into our family. Great grandmother Mah's grave was constructed so grandly, travelers stopped to look reverently at her grave. An ancient well was located next to her grave; the water in this well is very clear and tastes great. Villagers used its water to make lemonade which they sold during the hot summers. Both Mt. Lóngshān and Wai Dì Hú Lú are excellent burial places. Unfortunately, these burial places were destroyed during China's great Cultural Revolution. However, Mt. Lóngshān has been restored. Despite repeated invasion by other clans during recent years; our Shàng Jìng Tóu Village Mah neighbors restored the graves to their original condition. This unforgettable brotherly act is still remembered by the Yees today. Great grandmother Mah's grave was also destroyed and plundered. Years later, Běi Shān Village's Er Huò Gōng met with his clansmen and raised funds to rebuild the ancestral graves to their original condition. All the construction materials were delivered specially from Jiāng Xī. He also donated a pair of tomb couplets and erected a stone tablet nearby with the donor's name engraved. After four hundred years, the relationship between the Yees and the Mahs is precious and unique as we are like brothers in the same family whether in China or abroad. That's how the Yee and the Mah families became related many years ago. Hopefully this tradition will continue on for many more years. The translator of this article would like our Mah cousins to relate their side of their story also, to see if they have a similar or a different story. The translator would like to thank Ms. Nancy Nesbitt for helping out in reviewing and editing this translation. The translator acknowledges that although he has a clear responsibility to authors, and to preserve the meaning of stories interpreted; the translator is sometimes confronted with the loss of meaning, unity and presence of the history of the relationship between the Yees and the Mahs due to the archaic language used in source materials. However, the translator endeavors to provide the most accurate interpretation possible. If you know of a more accurate interpretation, please forward a copy or link to the translator.